» Filed Under: Beautiful Charts,Calling the Market. I expect that next week I’m going to be standing-by to identify the 20-week trough. Well, I am standing by – the market has fallen a little more, and yesterday price fell right into the middle of the BUY zone. 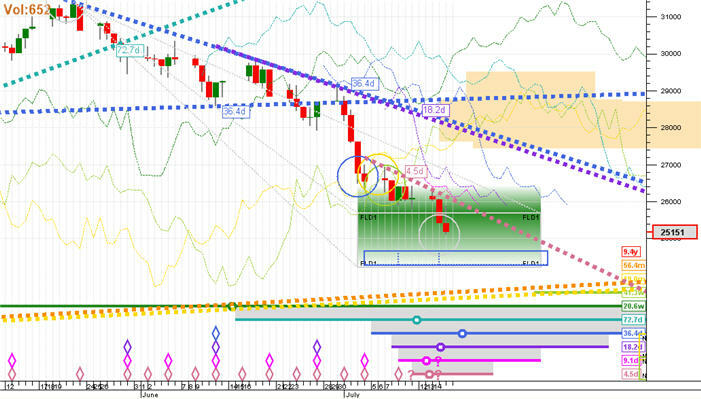 I’m not going to say “now the market will turn”, because that would be premature, but according to the analysis (shown below) the turn is near … the 20-day FLD high action signal is at 26400, so an extremely aggressive approach would be to go long at that level, however a more balanced and conservative approach would be to wait for the first 10 or 20 day cycle trough after the upcoming 20-week trough before doing anything. The only reason to feel aggressive is that several other shares on the JSE are giving buy signals, so there is a chance that the tide is turning. I own both the book and course and I agree that Hurst performed a really impressive and excellent job but how do you buy/sell and then exit the position ? Do you use his rules ? They were the part of his work which impressed me the least, frankly speaking.